This is more of a long biographical essay than a biography as such. It’s a short book, Hitchens’ ideas are well supported, but there are no source notes. It’s part of the excellent Eminent Lives series from Harper Collins. I was familiar with the name and controversial reputation of liberal Bush supporter (!) Christopher Hitchens, but had never read anything by him. At this point I really think I’d like to read more. Also would like to find time to read a few of the other books in the Harper Collins series. Hitchens deals with Jefferson in the context of a brand newly developing America and how Jefferson’s main concern was the establishment of a solid independent country rather than in abolishing slavery or any other philosophical ideal. He was basically a follower of generalized “Enlightenment” ideals and tried to put those ideas into action – difficult at best and Jefferson was certainly not a man without flaws. There are those who say America was “invented,” but Hitchens says it was more like Jefferson “authored” America what with the continuation of slavery and the purchase and exploration of the Louisiana Territory. I think basically Hitchens is a fan of TJ, although it’s sometimes hard to tell what with all the criticism sprinkled through Jefferson: The Author of America. I am more and more in awe that the US got created (invented, authored, etc.) at all. The individual colonies went from that lowly status to autonomy to a Confederation and on to one nation. The situation was not like in France where the ancien regime stayed on in the same location to be dealt with. After the American Revolution the British went back to England. Nevertheless, Jefferson soundly supported the French Revolution right down to the time when they beheaded their monarchs. 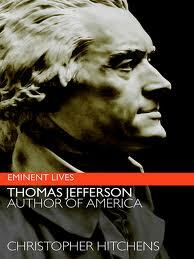 Jefferson’s horrified response was to the emancipation of the slaves – not to the beheading of their monarch. Apparently there was Jefferson’s first draft of the Declaration of Independence which included a very strongly worded paragraph against slavery blaming it on the English. (p. 27) The paragraph was deleted prior to signing – Jefferson also tried to end slavery in Virginia via the House of Burgesses but that too was defeated. Hitchens recreates the historical setting of all this quite well – reminds me of the actual situation at the time and also to keep my own standards of it today out of the picture. The US would never have survived had the slaves been emancipated at the same time – the South would have had a different country (or several – with slaves) and it would have all come apart under the pressures of the French, Spanish and English on the continent. As it was, the revolution did not spread to Canada. Interesting to note: Adam Smith’s “Wealth of Nations” which defended free enterprise and criticized the establishment of colonies, was published in 1776. I’d recommend Jefferson: The Author of America to anyone with an interest in Jefferson and a bit of background about his life – read the Jon Meacham book, Jefferson: The Art of Power, or something prior.